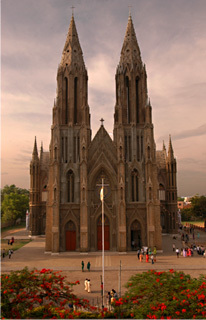 Saint Philomena Cathedral, Mysore, India. This beautiful Cathedral was built in 1956 and is one of the largest churches in the country. It has been built in the Gothic style with beautiful stain glass windows and lofty towers. The illuminated church in the evening is a wonderful site not to be missed. A priceless French statue of a celebrated Greek saint in a German cathedral located in the heart of India, is how some have described Mysore’s famous Saint Philomena’s Cathedral. 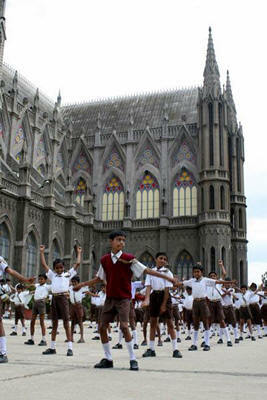 Located in the north of the city, on Cathedral Road, is Saint Philomena’s Cathedral, among the most majestic churches in India. Drawing inspiration from Germany’s Cologne Cathedral, this colossal church built in the neo-Gothic style was designed by the Reverend Rene Feuge. The cathedral has a crypt that houses a beautiful statue, acquired from France, of Saint Philomena, a 3rd century saint from Greece. 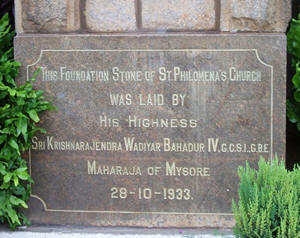 So plans for made to build a larger church and thus came into existence the famous Saint Philomena Church of Mysore. Maharaja Krishnaraja Wodeyar IV laid the foundation of the new church on October 28th, 1933 that was to be built in the place of the small church built by his grandfather. A Frenchman named Daly designed the church. The floor plan of the cathedral is in the form of a cross. The long part of the cross is the 'nave', which is the congregation hall. The two arms of the cross are the 'transepts'. The fourth part containing the altar and the choir is the 'crossing'. The Holy Mass is performed daily in Kannada, Tamil and English at the table in the sanctum sanctorum. Behind this is an exquisite marble altar on which the statue of Saint Philomena is placed. 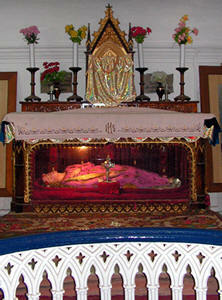 There is also an idol of Christ lying in his sacred wounds. Above the sanctum there are lovely stained glass windows from France with painting depicting the birth of Jesus Christ, the Last Supper, the Crucifixion and the Resurrection. The part of the church that is most attractive is the towers or spires. These towers resemble that of a cathedral in Cologne in Germany and those of St. Patrick's Church in New York. The two spires are 175 feet tall. 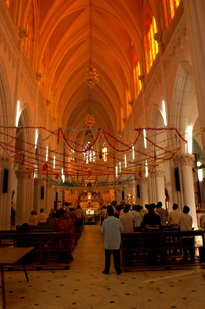 The entire church is built in the Gothic style is one of the largest Cathedrals in South Asia. The Church has the relic of the 3rd century Saint Philomena that is in a beautiful catacomb that is below the main altar. The construction of the church was completed under Bishop Rene Fuga's supervision. At that time Thamboo Chetty, was the Huzur Secretary to the Maharaja of Mysore, heard about the greatness of Saint Philomena and obtained a relic of the saint from Peter Pisani, Apostolic Delegate of the East Indies in 1926. After obtaining the relic it was handed over to Fr. Cochet. 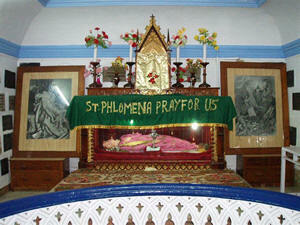 The next year a new state of Saint Philomena was brought from France. The story of Saint Philomena dates back to the 3rd century A.D. Philomena was the daughter of the monarch of a small state in Greece. Her parents were childless. They prayed to God and asked Him to bless them with a child and promised to convert to Christianity if their wish was granted. The next year Philomena was born to them. Even in her childhood Philomena showed signs of piety. When Philomena was 13 years' old her father took her to Rome to obtain the favour of Emperor Diocletion. The Emperor was enthralled by her beauty and wanted to marry her. But she refused and vowed to give herself to God. As she refused to marry the Emperor she was tortured and beheaded in Rome. The Cathedral is open from 5:00 a.m. to 6:00 p.m.